Curriculum Note: These 8 algebra software chapters represent the first full year of Algebra 1 as well as the first semester of Algebra 2. 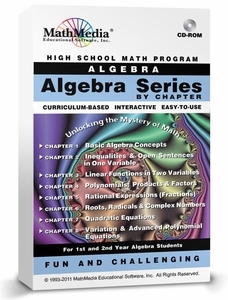 Advanced Algebra students should complete both this "Algebra by Chapter Series" and the "Advanced Math Series" which would then be the equivalent of 2 years of Algebra (Algebra 1 and Algebra 2), a complete course of Trigonometry, Pre-Calculus topics and Calculus Basics. 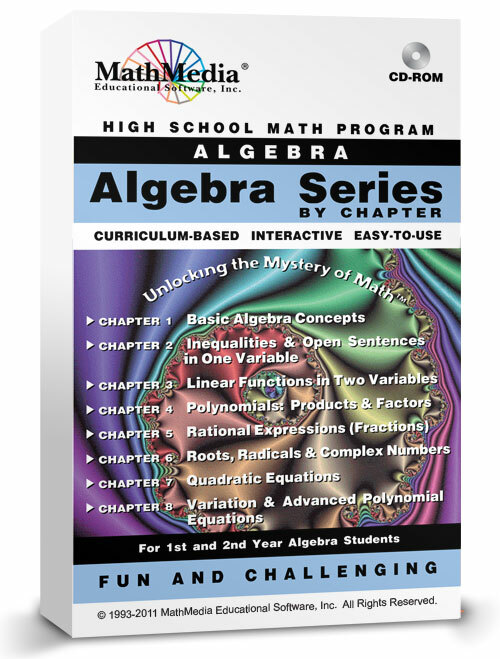 The Algebra Series by Chapter software takes the student through Algebra 1 from the very beginning -- just like starting a textbook on page 1. 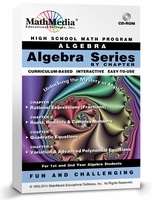 Each chapter introduces and teaches an algebra topic. Students work through interactive practice problems with step by step explanations that unfold upon request. As students progress through the problems presented in each section, they encounter more challenging types of problems representative of Algebra 2 difficulty level. Since learning math word problems are always challenging for students, each program in this Algebra software series has a separate section of Algebra word problems. This Algebra course is appropriate for students in middle school through college. 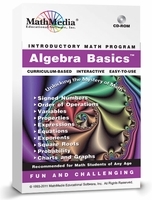 It is recommended for high school Algebra 1 and 2 students, and intermediate Algebra or college Algebra students. 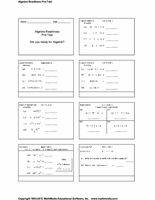 Algebra 2 and intermediate Algebra students must master these 8 chapters before moving on to more advanced math topics. Purchase the complete set of 8 Chapters for $299. Purchase Chapters 1 � 4 for $159. Purchase Chapters 5 � 8 for $159. Purchase Algebra Series by Topic (4 Programs) for $159. For a closer look at our academic software sample screens, scroll down. Click on the pictures of the instructional software title you wish to review.